"Not another mid-autumn chinese wedding!" your wedding guests must have thought to herself when she gets your wedding card. "Whose wedding dinner shall I attend?" The most popular month for chinese weddings must be the lunar eight month. It is considered the most auspicious month for chinese weddings. The moon is said to be at its biggest and roundest on the 15th day of the eight month of the lunar calendar, the Mid Autumn Festival. On Mid-autumn Festival, young noble born girls in ancient China were allowed to attend and participate in street festivities, shopping for novelties, enjoying the flowers on display, guessing lantern riddles and visiting the temples to pray for a good marriage. Many chinese romance stories were based on chanced meeting between lovers at mid autumn festivities. So, with this background there is much opportunity to make your chinese wedding banquet THE ONE that your friends will attend and remember. Don't let it become a run-of-the-mill regular and predictable chinese wedding dinner where people can't wait for the last dish to be served so that they can "escape" as soon as possible. Let them enjoy it so much they want to stay on to see if there are anymore "pleasant surprises". Make your grand entrance a memorable statement. Too often, the chinese wedding banquet first dish starts off with more fanfare than the bride and groom¡¯s grand entrance. That can¡¯t be right! After all, you are the star! YOUR entrance has to be the one people remember about the chinese wedding dinner, not some soggy cold dish. If you are having your chinese wedding dinner themed around the mid-autumn festival, a natural way of making your entrance memorable is to make your grand entrance a Lantern Parade...or make your second entrance a lantern parade, if you have already planned something big for your grand entrance. Make sure you check with the hotel or restaurant regarding their policy on having live candles in the lanterns. You can always use batteries operated lanterns although these do not have as much impact as the crystal paper, candle lit lanterns. When my brother and his wife had their wedding dinner during mid-autumn festival, they had a lantern parade where the young children present at the wedding banquet were invited to participate. The hotel staff was very enthusiastic and helped to organize the lighting of candles for the lanterns before the parade. We used a mixture of the accordion type paper lantern, with the bride and groom carrying the phoenix and dragon crystal paper lantern. The banquet hall had crystal globes with candles suspended from a batch of metal ¡°trees¡± and the effect when the lantern parade entered the hall was truly magical. Lantern riddles are traditionally played at 2 chinese festivals, the fifteen day of Chinese New Year and Mid Autumn Festival. Both these festivals are considered chinese Valentine Days. 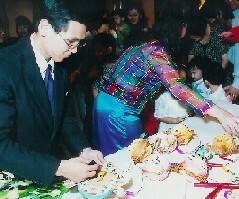 So lantern riddles is a romantic cultural game and suitable for chinese wedding banquet. Traditionally, chinese lantern riddles are written in a lyrical manner and requires some knowledge of chinese culture to solve. For chinese wedding lantern riddles you want your wedding guests to have fun and not come away feeling they have been slighted. Keep the riddles simple and fun, witty and romantic. Your game master may even need to give strong hints and encourage or bully people into playing. You may want to plant some players to get the ball rolling. A mixture of Chinese and English riddles or even trivia type of questions is suitable. Trivia questions are flexible and can be about the bride and groom. Keep the questions to the romantic theme of the wedding or to Mid Autumn Festival. Number the riddles and hang one riddle to each lantern. The game master will have the answer script to check against attempts to solve the riddles. Prepare prizes for each riddle answered correctly. You may also present the winner with the lantern that the riddle was hung from. If you are having a Mid-autumn Festival themed chinese wedding banquet, any chinese style wedding favor will tie in nicely with the theme. This can be a small lantern, a chinese-knot keychain, chinese handphone auspicious charm, a mooncake, etc.